The line graph shows the consumption of spreads in grams between 1981 and 2007. Overall, it can be seen that the consumption of low fat and reduced spreads were higher than the other two spreads. To begin, the most popular spread that consumed in 1981 was butter at around 140 grams, which is far higher than its counterpart margarine at around 90 grams and then decreased until they both meet in the year 1991 at 100 grams. Then, the consumption of butter decreased continuously and finished at just under 60 grams, while margarine stayed constant for a while and then decreased to 40 grams in the year 2007. 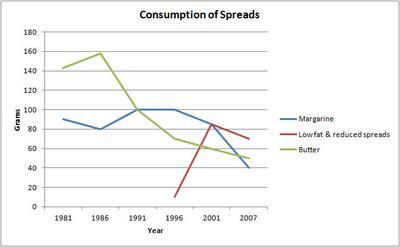 In sharp contrast to this, the consumption of low fat and reduced spreads did not even introduce until 1996, it then increased drastically until it dominated both butter and margarine in 2001 and then had a slight fall to finish at just under 80 grams, which is still the most popular spread in the year 2007.